Eye problems are among the most significant complications of diabetes, which is the most common cause of vision loss in the UK. Optometrists have an important role to play in detecting the disease and in monitoring the eyes of people with diabetes once diagnosed. Checking the appearance of the retina with a special lens called a volk lens in combination with a lighting system gives the optometrist a 3D view of the back of your eye and it is the most commonly used test for diabetic eye problems. 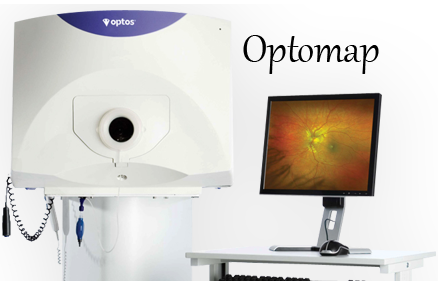 Photographs of the retina using our optomap retinal scanner may also be used to detect and monitor any abnormalities. If diabetes is suspected, your optometrist will refer you to a GP or hospital for medical advice. If diabetes is diagnosed, your eyes will need to be examined regularly for signs of associated eye problems. You may be referred to a hospital eye clinic or be referred back to your optometrist for regular monitoring (known as Diabetic Retinopathy Screening or DRS). Even though your vision may be good, changes can be taking place to your retina that need treatment. Remember, however, that if your vision is getting worse, this does not necessarily mean you have diabetic retinopathy. It may simply be a problem that can be corrected with spectacles. Your optometrist will be able to decide what is causing any reduced vision.